Projects associated with programs at the Center for Teaching Excellence have led to national recognition for two KU professors. Ward Lyles, left, speaks with Krzysztof Kuczera during a session of Diversity Scholars. Ward Lyles, assistant professor of urban planning, received one of three curriculum innovation awards from the Association of Collegiate Schools of Planning and the Lincoln Institute of Land Policy. 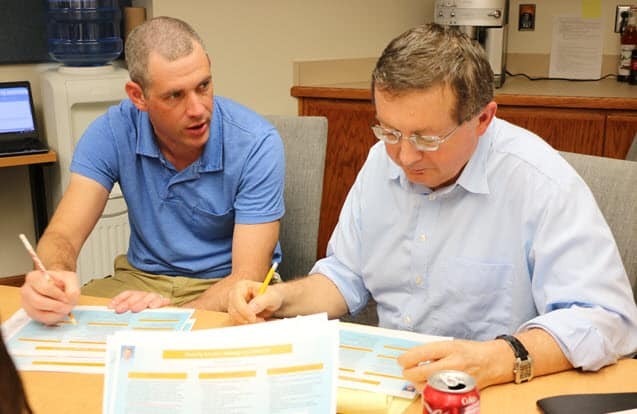 Lyles developed a quantitative methods course that uses team-based learning and focuses on the type of work planners do in their communities. Lyles’s class emphasizes the importance of equity and inclusion, and he said his work in CTE’s inaugural Diversity Scholars Program allowed him to think through ways to make the class more inclusive. That includes reflection sessions on how personal and group identity shape thinking. 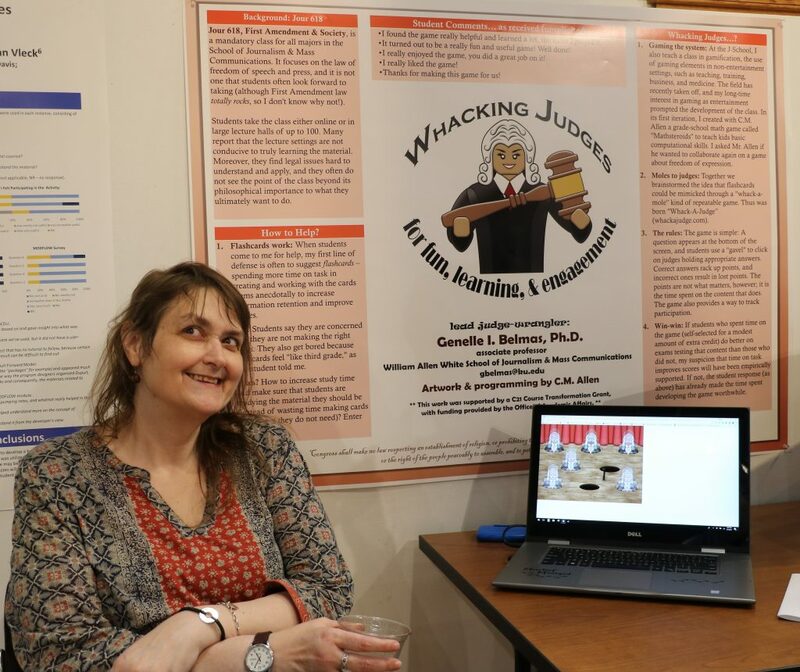 Genelle Belmas with a poster explaining her game Whack-A-Judge. Genelle Belmas, associate professor of journalism and mass communications, won top honors in a teaching competition sponsored by the Law and Policy Division of the Association for Education in Journalism and Mass Communication. Whack-A-Judge is intended to help students learn concepts for First Amendment and Society, a 600-level class that focuses on media law. The game, which is modeled on the arcade game whack-a-mole, flashes questions at the bottom of an on-screen game board. Players click (or whack) on judges who emerge from holes on the board holding signs with the names of court cases. The goal is to whack the judge with the right answer before that judge disappears back into a hole. Preliminary results showed that the game improved students’ test scores, Belmas said. Adjusted for inflation, states’ per-student spending on higher education has declined by 25 percent since 1997. That’s no surprise. I’ve written before about a similar decline in spending in Kansas. Net tuition at a public four-year university doubled between 1997-98 and 2017-18 as states reduced per-student funding by 25 percent. Net tuition is what a student pays after grants and scholarships are figured in. For every $1,000 per student that states cut from college and university budgets, tuition rises by $300. That translates into thousands of dollars coming directly from students’ pockets, or more likely, dollars added to students’ debt. In total dollars, state funding for public higher education increased 13.5 percent between 1987 and 2015. Yes, it increased. The bigger issue is that during that same time, enrollment grew more than 57 percent. It’s a classic example of being asked to do more with less. That growth in students especially taxes large state universities, which, Webber says, have taken in the vast majority of new students but “have long since exhausted their economies of scale.” That is, it is extremely difficult to add more students without charging more or reducing the quality of education. Most certainly, rising health care costs are eating up more and more of states’ budgets. As Webber cautions, though, it’s impossible to say that an increase in one budget item “causes” a decrease in another. Nor must increases in one area lead to cuts in another. That’s a political decision. And Webber emphasizes that the figures are averages for all states. For instance, Vermont’s spending on public welfare increased three times more than Utah’s. Similarly, six states actually increased their per-student spending on higher education (Connecticut, Mississippi, Nebraska, New Mexico, Oklahoma, and Wyoming) while Pennsylvania cut its contributions by 56 percent. As Webber says, there isn’t just one story about how states spend their money. There are 50 stories. The statistics, though, reflect the challenges that state lawmakers confront each time they create budgets. It has become clear over the past two decades, though, that higher education isn’t high on that list of budget priorities. The University of Missouri system will eliminate or merge 12 graduate programs and eliminate 474 jobs as part of a $100 million budget cut, The St. Louis Post-Dispatch reports. You can see a list of the affected programs here. … The Department of Education expects to open bids this summer on development of $5 million in open educational resources, The Washington Post reports. Congress included that money in the 2018 federal budget. … Google has made Google Scholar easier to use on a smartphone. New mobile-friendly functions provide article previews and the ability to swipe through articles for reading. Google Scholar on mobile also allows you to save articles to a “My library” folder for later reading on a computer. The University of Kansas has made many gains in its recruitment of minority students, who now make up 20.6 percent of the student body. By at least one measure, though, the university still has considerable work to do. According to an analysis by The Hechinger Report, there is a substantial disparity in the number of Latino students who enroll at KU compared with the number who graduate from state high schools. Hechinger looked at enrollment rates for Latino and black students at public flagship universities in each state. KU had the 15th largest gap in Latino students. Here’s what that means: About 16 percent of Kansas high school graduates in the spring of 2015 were Latino. That fall, 8 percent of KU’s freshman class was Latino, a figure that rose to 8.7 percent by Fall 2017. 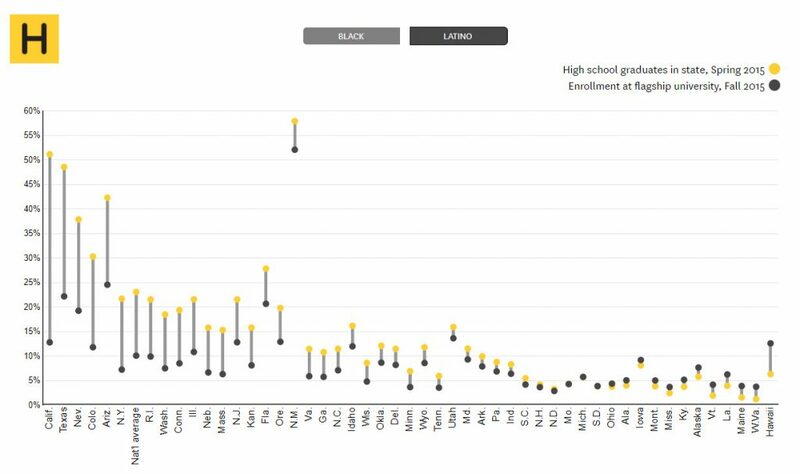 The highest disparities between the number of black high school graduates and blacks enrolling in flagship universities were primarily in the South, Hechinger said, with Mississippi showing the largest gap. Black students made up more than 50 percent of Mississippi high school graduates in the spring of 2015 but only about 10 percent of the freshman class at the University of Mississippi that year. Among Latino students, the largest disparities were in the west: California, Texas, Nevada and Colorado. For instance, Latinos made up more than 50 percent of high school graduates but only about 12 percent of the freshman class at the University of California, Berkeley. Inside Higher Ed speculates that Amazon may be preparing for a move into higher education. That’s because the company has hired the Stanford researcher Candace Thill, who has taken a leave of absence from the university to become Amazon’s director of learning science and engineering. Amazon and Thill had little to say beyond that. Thill was a founding director of the Open Learning Initiative at Carnegie Mellon before moving to Stanford. She has helped create online learning materials based on findings from learning science, arguing that such materials can tailor feedback to individual needs, thus speeding up learning and leading to better scaling of classes. The Open Learning Initiative is a competency-based system, meaning students work at their own pace, moving into new material only after demonstrating their understanding of previous material. The online system provides data to instructors and course designers, helping them improve course design and make better use of class time. Using online learning to scale classes and reduce costs has been a dream of administrators and educational technology companies for years. Results have been mixed at best, with tech companies proclaiming grand breakthroughs even as instructors find that high-quality online teaching often takes more time than in-person teaching. Higher education still sees digital technology as an important means of innovation and transformation, Jim Hundrieser, associate managing principal at AGB Institutional Strategies, said last month at the annual meeting of the Association of American Colleges and Universities. Colleges are struggling to find a sustainable business model, he said, and that could lead to a hard fall, much as publishing, textiles, music, steel, trucking, telecommunications and other industries have taken. Hundrieser predicted that the number of online courses would continue to grow, especially because of their ability to reach students in remote areas, make learning more convenient, and allow for collaboration across time and space. He’s right, although universities can’t simply toss out lackluster materials online and expect students to respond enthusiastically. Good online teaching requires a rethinking of pedagogy, course structure, student interaction, and learning itself. Universities still have some time to improve and expand their online offerings, but that time is drawing short as competition increases. If Amazon puts its enormous resources and brainpower behind educational technology and online learning, they had better be ready. Course fees add hundreds or even thousands of dollars to the cost of a college degree. They are calculated separately from tuition, so they can hit hard when students’ bills come due each semester. Starting this fall, the University of Colorado will eliminate most of those fees. Students will still pay fees for such things as the university bus system, recreation center and health center, but they will no longer pay course fees that range from $1 a credit hour to $1,255 a semester. That will save students $8.4 million a year, the university said. The university is also spending $1 million on a pilot program that will provide open online textbooks to students at a fraction of the cost of publisher-created books. The university system’s chancellor, Phil DeStefano, said in a university address that CU hoped to increase graduation rates by reducing educational costs. Both the elimination of course fees and the investment in open educational resources are excellent moves. Of course, the university will have to absorb the costs, essentially cutting its income by $8.4 million a year. This is at a university system that ranks near the bottom nationally in state funding. So how can it do that? The university cited rising enrollment and retention rates. CU expects 40,000 applicants (up from 37,000 in 2017) for this fall’s freshman class of 6,500. In contrast, KU has about 15,000 applicants each year. It accepts more than 90 percent of those students, but only about 4,000 eventually enroll. More students are also transferring to CU, the Daily Camera of Boulder reports, and the university has increased its freshman retention rate to 87.5 percent, from 84 percent a few years ago. Those two things alone account for a substantial increase in revenue. Growth almost always makes budgeting easier. CU also charges nearly $28,000 a year in tuition for in-state students and $52,000 a year for out-of-state students. In contrast, in-state residents pay $19,600 a year at KU; those from outside the state pay about $25,500. It doesn’t hurt that the Denver to Boulder corridor is one of the country’s fastest-growing technology and biotechnology hubs, bringing employers and research dollars to the area. And then there are the mountains and the, uh-hum, weed. For every Colorado, though, there is an Illinois, which lost more than 19,000 students to other states in 2016, The Chronicle of Higher Education reports. The University of Illinois system has frozen tuition to try to keep more students in the state, but the number has risen for five consecutive years. American higher education has taken a beating over the last 40-plus years. Many of those blows came from the outside. Many others were self-inflicted. I won’t rehash those here, other than to say that higher education has done a poor job of fighting back. Much of the time, it has seen itself as above the fray. Its arrogance not only blinded it to its own shortcomings but let critics paint an unflattering portrait that has lingered in the minds of millions of Americans. Thankfully, colleges and universities have awakened from their slumber and started to realize that they must live within the broader society, not separate from it, and that they must make a case that higher education plays a vital role in democracy and the American dream. Yes, that sounds lofty. But it is crucial if we hope to maintain our colleges and universities as places of knowledge, aspiration, and above all, hope. Speakers at the conference’s opening plenary were blunt about the problems that higher education faces. The United States used to be the world leader in degree holders, Lynn Pasquerella, president of AAC&U, told participants. It now ranks 15th. Public higher education was once a truly public venture financed mostly by taxpayer dollars. Now it is public in name only as colleges and universities rely increasingly on private fundraising, tuition dollars, and grants to pay the bills. That, in turn, pushes institutions to obsess about rankings, which pushes them to seek students with higher test scores, which pushes them to build luxury facilities, which forces universities to seek private financing and push up tuition costs, which puts college further out of reach for more and more families. That chain of events has led to both a financial and moral crisis in higher education, said Linda Martin Alcoff, a professor at City University of New York. Privatization has turned students and faculty into “human capital,” she said. Rankings have “infected” every faculty search as departments seek out stars who can improve rankings, Alcoff said. Faculty achieve star status by attracting private grant money, which has deteriorated the civic nature of higher education, she said. Tamara Draut, a vice president at the public policy organization Demos, said that we in higher education must work to “unleash that era of possibility” that allowed so many people to get through college without enormous debt. Debt has poisoned higher education by creating an obsession with rankings and a need to recruit increasing numbers of out-of-state and international students, who pay higher tuition. She gave the example of a young woman who called in to an NPR show that Draut participated in. The young woman, who had an art degree and was working at a community center teaching art to children, was having a difficult time paying off her college debt. The next caller ranted about the young woman for “daring to get an art degree” rather than an engineering or technical degree. AAC&U members clearly took an inclusive view of higher education, as they should. College was once only the purview of the elite, and the rising cost of attending is clearly pushing it that way again. That either/or narrative only sours people on higher education, she said. College is important, she said, but it is not a solution to poverty, prejudice or the growing gap between the ultrawealthy and everyone else. “Higher ed is great, but it’s not all we have to do to fix society’s economic and racial inequality,” Draut said. 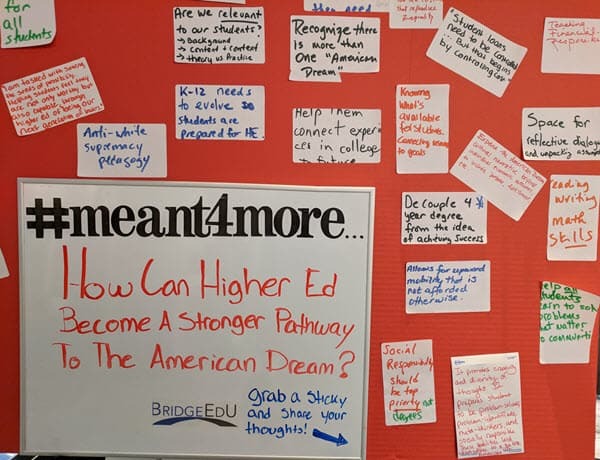 Panelists throughout the conference issued a call for educators to push for policies that provide broader access to higher education but also help re-establish a broad middle class. “Teaching the poor should not be a niche market in higher education, but that’s what it has become,” Alcoff said. Wes Moore of the Robin Hood Foundation urged educators and alumni to tell their stories about the importance of higher education. Statistics can be helpful, he said, but they can also be manipulated. Alcoff offered a similar point, saying that we must espouse the importance of higher education without alienating those who choose not to – or can’t – get a degree. By linking a college education to social mobility, we leave out a large portion of the American population. We must also make room for less-than-perfect students who aspire to the intellectual challenges of college, Alcoff said. With what she described as a “checkered past,” she never would have made it through college in today’s environment, she said. She was on her own financially at age 16, earned a GED, dropped out of college, found her way back, and eventually graduated. College is no longer forgiving for such students, she said, especially with costs that weigh on students for years. Naomi Barry-Pérez, director of the civil rights center for the Justice Department, tied decreased funding of higher education and many social programs to a backlash against the civil rights and women’s movements in the 1950s, ’60s and ’70s. Government programs aimed at making society fairer were demonized once women and people of color gained more power, she said. We are the richest nation on earth, she said, but we life in a perpetual state of austerity. “We have to be champions of reinvesting in ourselves,” she said. As passionate as the speakers were, they offered few solutions to entrenched problems that have been exacerbated by polarized politics. In most cases, there are no clear answers. In the closing plenary, the author William Deresiewicz told conference-goers that higher education had been in crisis “since the beginning, perhaps since 1636.” The problems have changed, though, with the biggest today being the decline in education funding. He said, though, that academics needed to delve more deeply into their own beliefs and actions. We talk about freedom, equality and justice, he said, but rarely think about the conflicts inherent in them. Equality often demands the diminishment of freedom, he said. We want to encourage creative expression, but at the same time, we have a need for all people to feel safe. That, in turn, often requires restrictions. Dealing with those conflicts is difficult and troubling, he said. Nobody wants to think about their own beliefs, values, and assumptions. At colleges and universities, that inaction silences voices and distances academia from the rest of society, he said. He told of a recent experience in teaching a writing class for college juniors and seniors. All of the students were ill-prepared to read deeply, analyze others’ work, or to make strong arguments. These were smart students, he said, but they had learned only a technocratic form, one in which difficult question could be worked out in predictable ways. They also thought of writing as “something that just happened,” rather than as a process that requires persistent revision and questioning. He pointed to several things he said were at the heart of the problem: social media and its fast-paced, anything goes mentality; grade inflation; adjunct instructors who can’t afford to spend time with student papers; and professors who lack incentives to take the time. If we spend all our time focusing on skills that can be scaffolded and measured, he said, we miss opportunities to delve into bigger questions like values, purpose and meaning that can transform students during their time in college. All too often, the humanities converts open-ended questions into things that can be assessed and tested, he said. As a result, students think fundamental questions about life and meaning have been settled. They learn to spout opinions, but recoil at the idea of public argument. They talk about things like patriarchy, intersectionality, trigger warnings, and microaggressions, but they are lost when they have to think outside those categories or are asked to examine what they mean or how others might feel differently. “Big questions are big questions because no one has the answers,” Deresiewicz said. What he failed to mention is that the dogma that afflicts the left also afflicts the right, making meaningful conversation and compromise even more difficult. Like other speakers at AAC&U, though, he was spot-on in calling for higher education to take a deep look inside itself. That’s the only way we will find a way forward. I’ve written frequently about how the lack of a reward system hampers (if not quashes) attempts to improve teaching and learning, especially at research universities. A new survey only reinforces that short-sighted approach. The survey was conducted by the consulting and research firm Ithaka S+R and involved a random sample of faculty members at U.S. universities in 2015. Ithaka has conducted the survey every three years since 2000. The survey did offer reason for optimism: More than 60 percent of faculty members said they would like to use digital technology and new pedagogies to improve their teaching. The problem: Only 35 percent said their universities recognized or rewarded faculty for innovations in teaching. The upshot: Most courses at most universities will remain mired in the past, failing to move beyond a curricular approach that emphasizes delivery and regurgitation of information over critical thinking, application, and adaptability. Only a small number of faculty members will be willing to risk the challenge of pedagogical innovation. That’s especially unfortunate given another of the survey’s findings: More than 60 percent of faculty members in the humanities say that undergraduates do a poor job of finding and evaluating scholarly information. Those in the social sciences, sciences and medical fields are slightly more positive, but overall 54 percent of faculty members find students’ research skills lacking. The United States has a larger number of colleges and universities relative to overall population than any other country. That provides more opportunities for more students, but it has also made it difficult for universities to distinguish themselves from one another. Research universities, especially, could do that by elevating the importance of teaching. Not only could students learn from top researchers and professionals, but they could learn in creative and innovative ways that would benefit them in the long run. Or they could continue along the current path where teaching is treated as an afterthought, where one university pretty much looks like all universities, and where pedagogical innovation continually meets frustration. Nearly 40 percent of faculty said open access materials were important to their teaching, but 25 percent said those types of resources were hard to find. The percentage of faculty members looking to libraries to help undergraduates improve their research skills grew by 15 to 20 points between 2012 and 2015. The jump was largest among scientists. The percentage of faculty who start their research at a physical library has dropped to nearly zero, though humanists are more likely than other disciplines to start at a library. Most start with either a general search engine or a specific database. A slightly smaller percentage start with a library catalog. Recent statistics cast stark relief on the financial challenges that public colleges and universities face. Between 1991 and 2008, enrollment at public colleges and universities grew 23 percent, although state support for those institutions rose only 13 percent. By 2010, enrollment rose an additional 8 percent while state support fell by 7 percent. The statistics come from an analysis of federal data by Steven Brint and Charles Clotfelter. Their article “U.S. Higher Education Effectiveness” was published this month in the Russell Sage Foundation Journal of the Social Sciences. That declining state support has led to a growing reliance on part-time instructors. Non-tenure-track faculty now make up 37 percent of college and university faculty, up from 19 percent in 1970. Just as disturbing, the growth in spending on instruction has lagged that on student services and research. Actually, “lagged” isn’t quite the right word. Colleges and universities devoted two and a half times as much additional money to research (2.6 percent growth) as they did to teaching (1.1 percent), and nearly twice as much (2.2 percent) to student services. Another study, from an initiative of the American Academy of Arts and Sciences, says that public flagship universities must adopt new financial models given the declining support from states. It called for states to increase their financing of public universities but said universities must reduce costs, seek out additional forms of revenue, and form new public-private partnerships. Those are pertinent questions given that the number of Americans with high-quality postsecondary credentials lags the needs of a digital-age economy. The future of higher education depends on how we answer that. Faculty Focus offers a useful list of ways to deepen student learning. … A study of Chicago high schools found that students did considerably better in face-to-face courses than in similar courses online, NPR reports. … Schools that increasingly rely on digital resources also open themselves to risks of data breaches, PBS reports. Recent news, research, trends and thoughts about education. Compiled by Doug Ward. One of the most important elements in that list is the idea that there are no right or wrong ways to innovate. That’s an important point for educators to keep in mind. To maintain good teaching, we must constantly innovate, reflect and revise. The list fails to mention another important element of innovation, though: risk of failure. All innovators take risks, fail and try again. Of course, if you want to innovate, you have to be willing to take that first step. Maryellen Weimer raises good questions about colleges’ use of flipped courses. She applauds active learning, she says, but then asks: How do we know which students have the right study skills for flipped courses? Which students learn most in flipped courses? Do all courses work well in a flipped model? I’m a big proponent of flipped courses, but Weimer’s questions should linger in all our minds. Kansas’ funding per full-time equivalent college student dropped by nearly 13 percent, or $894, between 2008 and 2012, according to a report by the Center for American Progress. That’s a 12.77 percent cut, placing Kansas in the middle of the pack for state financing of public colleges and universities during that period. Arizona ranked last, slashing financing by nearly 43 percent. North Dakota topped the list, increasing per-student financing by 19 percent. To make college more affordable, the report recommends a new federal formula that encourages states to invest more in higher education but also sets goals for improving graduation rates and making transfer among institutions easier. Relatedly, John Ebersole, president of Excelsior College, says that dwindling state financing has some institutions considering going private. In an article for Edutopia, Donna Wilson and Marcus Conyers offer ways to help students learn metacognition, or how to “drive their brains.” … In Educause Review, administrators from North Carolina State and the University of Pennsylvania write about the role that libraries can play in creating innovative teaching spaces. … A new report says that community colleges’ short-term certificates offer only small economic returns, especially when compared with degrees or other programs that require additional time to complete, according to Diverse: Issues in Higher Education. Those certificates, which require less than a year of coursework, are growing in popularity.